Abbreviation SNILS stands for "insurance number of individual personal account" the pension insurance system. Computerization is firmly established in life, people get used to use public services online, so the question about getting a social security number via the Internet is very actual. 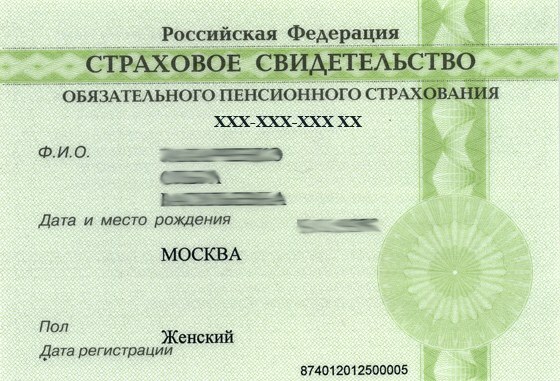 To obtain this document you need a personal visit to the local branch of the pension Fund of the Russian Federation. Fill in the form, which will give you employee PF. However, the form ADV-1 it is possible to find on the Internet, fill in and print at home and then bring to the PF office. Details of the questionnaire are given in nominative case, need to fill in printed letters and black helium pasta in neat, legible handwriting. Each letter needs to stand in your square. Enter data name and check the desired gender (male, female). Date of birth is filled in the format "01 January 2014". Specify the place of birth. Names of administrative units should correspond to the data of the passport or other identity document. Write full postal address on the basis of residence. If the data were different from the actual place of residence, fill in the details of the "actual Address" as well as your home, work and mobile phones, in case of necessity you can quickly be contacted. Select code, name, series and number of identity document on the basis of which the application form is completed, as well as data on how, when and by whom it was issued. Document code can be found in the reference document types. The name of the authorized body can be reduced. Write the date of filling the questionnaire in the format "01 January 2014" and your signature with details. Apply for obtaining SNILS on the website gosuslugi.ru . For this, go to the tab "authorities" - "the Ministry of labour and social development" - "Pension Fund", "All services". Select "Receive from insurers statements about the voluntary introduction in legal relationship on compulsory pension insurance" . The procedure is similar to filling in the questionnaire by personally visiting the PF office. Assure the correctness of the data of his electronic signature. However, for the card will have to come to the PF office personally. Upon receipt of the card SNILS on the baby need to apply to the office PF filled application form, the passport of the parent, birth certificate of the child.